Rufus “R.C.” Clifton Echols, Jr.
Rufus Echols, Jr. was born November 25, 1903 in Mangum, Oklahoma and he began his education there before moving to Waco in 1917. 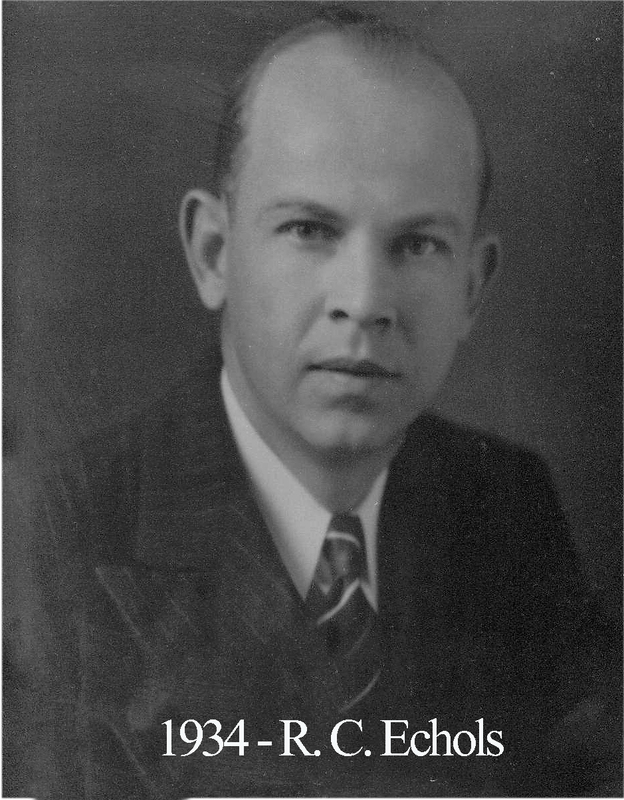 Echols’ career was spent working for the Amicable Life Insurance Company where he started in 1923. He rose to registrar of the firm. He left Waco in 1945 to take over the company’s branch in Bryan. Ever the socialite, RC rarely missed meetings of Waco 92, the local Rotary Club, and the Junior Chamber of Commerce. He was also active with the Demolay Chapter where he was serving as scribe in 1923. During his year as Master of the Lodge in 1933, Echols hosted a musical event for area masons where well-known harpist Maudetta Martin Joseph performed. His Waco home was at the corner of 4th Street and Dutton Avenue. Today it is the location of a busy intersection of Baylor’s campus between the IHOP and the Subway/gas station.